I'm having a wonderful couple of weeks helping four different readers with their furniture painting projects! 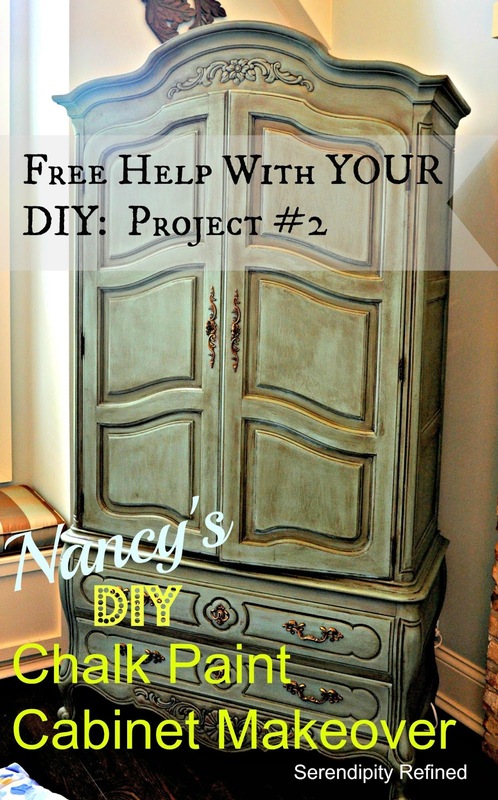 Today, I'm sharing chalk paint transformation number two: Nancy's dark stained armoire. 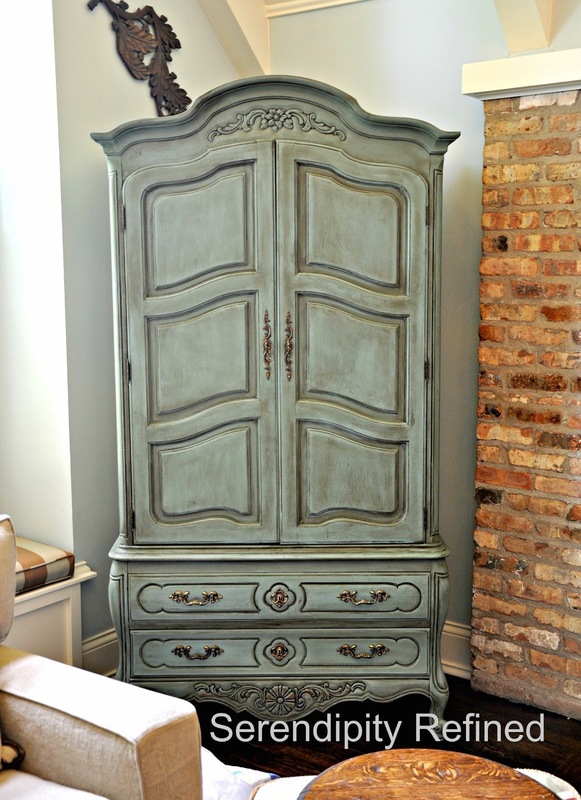 We used ASCP Provence (exterior), French Linen (interior), and dark wax on this piece. 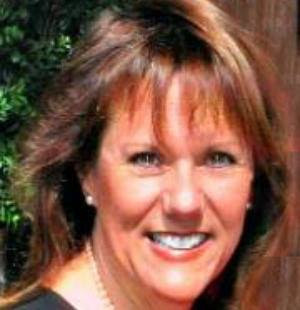 I had never met Nancy until she answered the door at her beautiful home on Monday evening, but I knew from the moment that I walked up to her wooden screen door and saw the exposed beams in her living room ceiling that we were going to be fast friends. 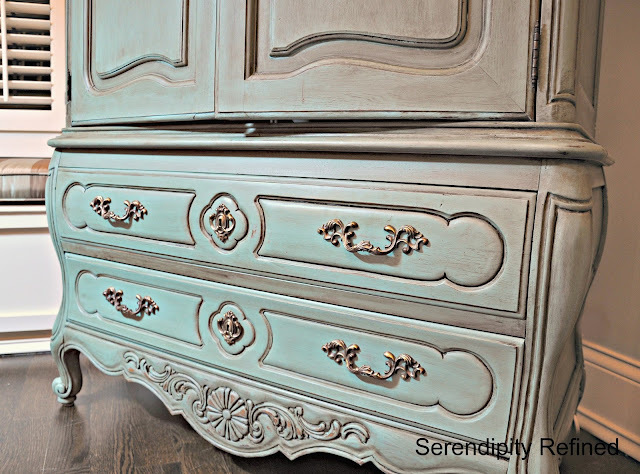 Nancy chose ASCP "Provence" for the exterior of this piece and, after we talked about it, she decided on "French Linen" for the interior. As you can see from the photo above, Nancy had brushed one coat of Provence on one of the doors prior to my arrival. She mentioned that she was concerned that it was too bright but I assured her that once we applied the dark wax, the color would darken and it would bring out the green undertones. She agreed to take a chance and we got to work! Did I mention the fact that her home is amazing?! Do you see the exposed brick wall in the photo above? 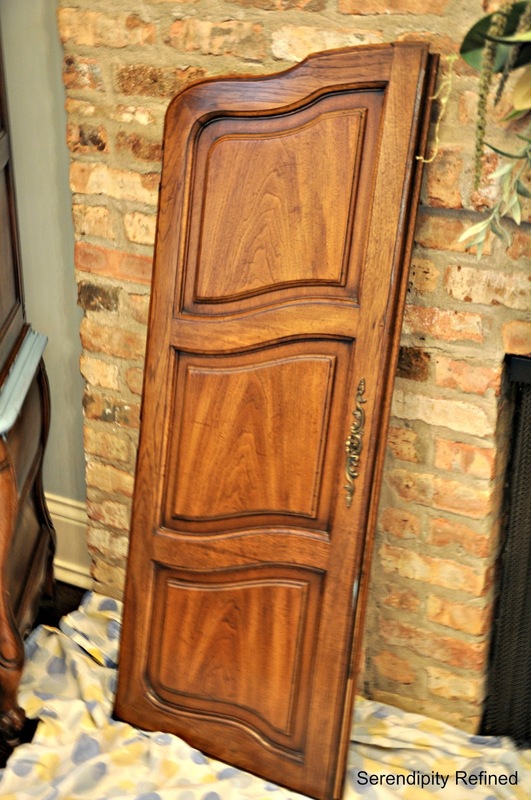 If you think that's fun, you should see the repurposed 16 pane window that's now a mirror in her hall. I adore her style! And, Oh. My. Gosh!!!! her kitchen!!! 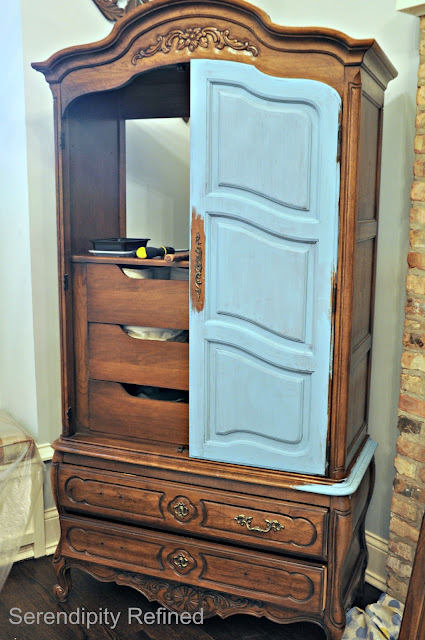 That could be an entire post in itself, so let's get back to the armoire that we transformed, okay?! 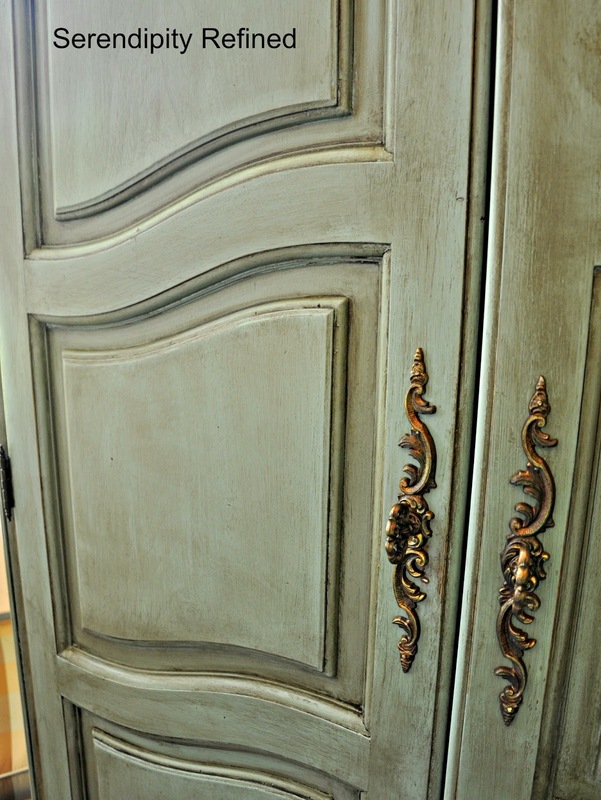 In about two hours on Monday night, we disassembled the cabinet and painted the exterior with two coats of Provence. To be completely honest, we didn't work on the piece for the entire two hours. 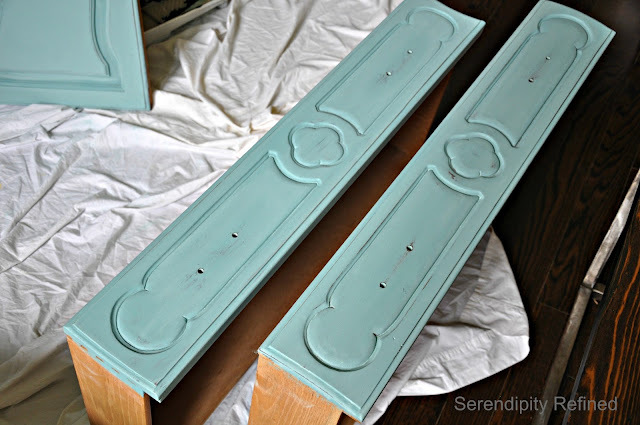 I was thrilled when she asked if I'd provide paint suggestions for a large piece that had been her mom's buffet, now housed in her closet as well as her living room table and a lamp....this meant that I got a quick tour of her wonderful home! 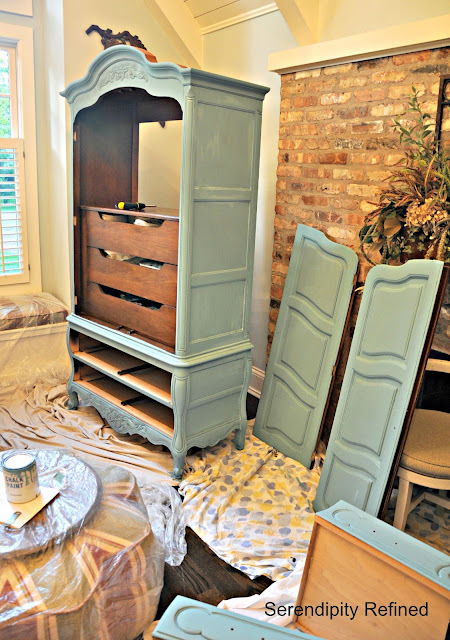 On Tuesday, Nancy painted the interior of the piece with two coats of French Linen then, on Wednesday night, we sanded, lightly distressed and waxed the piece with Annie Sloan Dark Wax. Then, we re-assembled the doors and re-used the original hardware. Total time involved, about 5 hours plus the time that Nancy spent painting and waxing the interior. 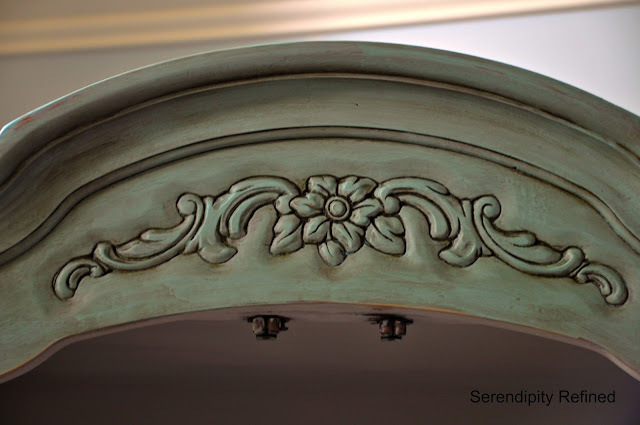 The photo above shows the dramatic difference that dark wax can make in the color of a piece. 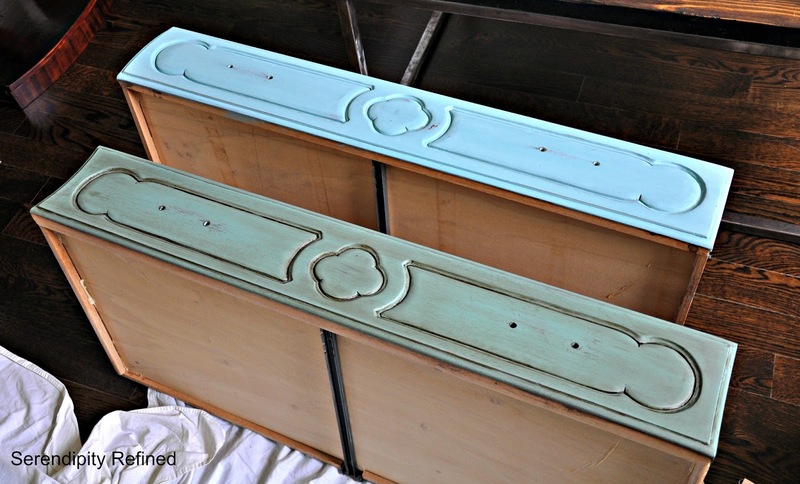 The top drawer has been painted two coats and lightly sanded but not waxed. 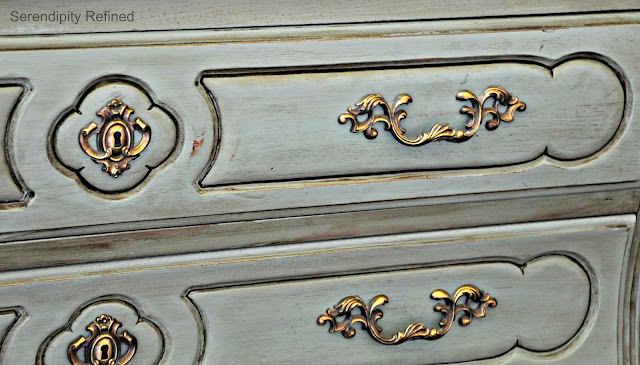 The bottom drawer has dark wax on it. If I hadn't been having such a delightful time chatting and discussing her "next projects", we probably could have completed the entire piece in about four hours. Time flew by as we chatted.... and painted.... and waxed. I'm thrilled that I had the chance to meet a new friend and help her to learn about how to paint furniture using chalk paint. I have to admit, though, that my favorite part of this project was when we were finished on Wednesday evening and Nancy came down the stairs after she had gone upstairs for something. As she reached the landing of her open staircase, she glanced over at the piece and said, "It looks as if it has been there all along..." That made my heart happy. Painting furniture for myself or for resale is fun but there's nothing that I love more than seeing and hearing the reaction when I help someone else to transform an "ugly duckling" into a one of a kind piece for their own home and to teach them how to do it them self the next time! 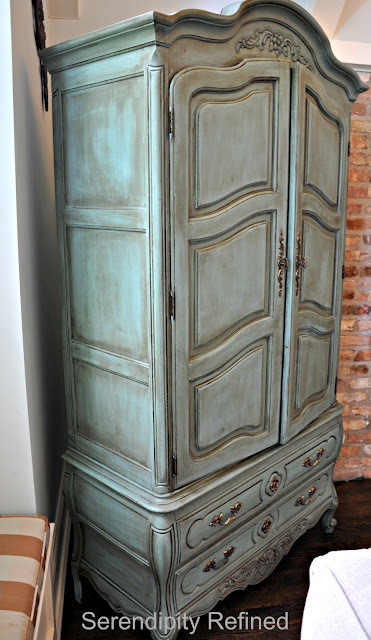 Nancy's formerly heavy, walnut stained,cabinet is now a Provence chalk-painted, French beauty who stands proudly in the corner of the living room and I know (because Nancy told me so) that it won't be long before she is joined by another painted piece or two. I can't wait to see what Nancy does next! I owe a huge "thanks" goes to my new friend, Nancy, for allowing me to be a part of her very first painted piece! You ROCKED IT, girlfriend!